News of the Government’s “Strategy for Protecting Crowded Places from Terrorism” is a forward step for security within the community. But imagine how confronting it must be for the average venue operator/owner to operate a business in this day and age. Instead of a one-time focus on drunken louts and illegal entry to a music concert, for example, they must now factor in security planning to prevent murderous extremists from a vehicle, chemical, firearms and improvised explosive device attacks. Welcome to surreal Australia in 2017. We don’t live in an environment that has witnessed civil war or regular terrorist attacks. Australia as, it stands, is still a comparatively benign and innocent environment, notwithstanding tragic events that have transpired, and others that have been intercepted in recent years. 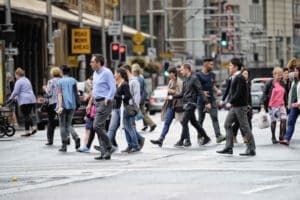 Arguably, such events have not yet had such a deleterious effect as to significantly influence our collective national psyche, the concrete vehicle barriers in the CBDs of Sydney and Melbourne, among other measures, takes the issue to another level. The need to issue confronting security advice to owners and operators of all ‘crowded places’ takes it to the next level security-wise. There appears to be no end in sight to this terrorism threat; as such, those responsible must continue to increase their collective ability to deter, detect, respond and recover from terrorism-related attacks. If you have ever seen a security risk assessment for the average ‘crowded place’ or event, you may agree that in the absence of security expertise and training, the odds are weighed heavily against operators to carry out advanced security planning. And while the Crowded Places Security Audit and Self-Assessment Tool is useful in drawing attention to areas of concern, it doesn’t compensate the need for genuine competence in assessing and implementing risk mitigations. Some advice in this regard is offered on page 13 of the accompanying guide. If you are responsible for the security of a crowded place, and especially if you do not have a security background, it would be prudent to read through the new strategy, then complete the security audit and self-assessment tool. This should provide an initial understanding of where the Australian government is coming from in its thinking, and suggestions to improve protective security programs for your site(s). If you require assistance and genuine expertise in this process please feel free to contact Agilient today.